Keep your vehicle's interior clean and uncluttered by transporting wet, dirty or oversize gear in this roof-mounted cargo basket. Durable, lightweight aluminum carrier fits Thule roof-rack square crossbars. 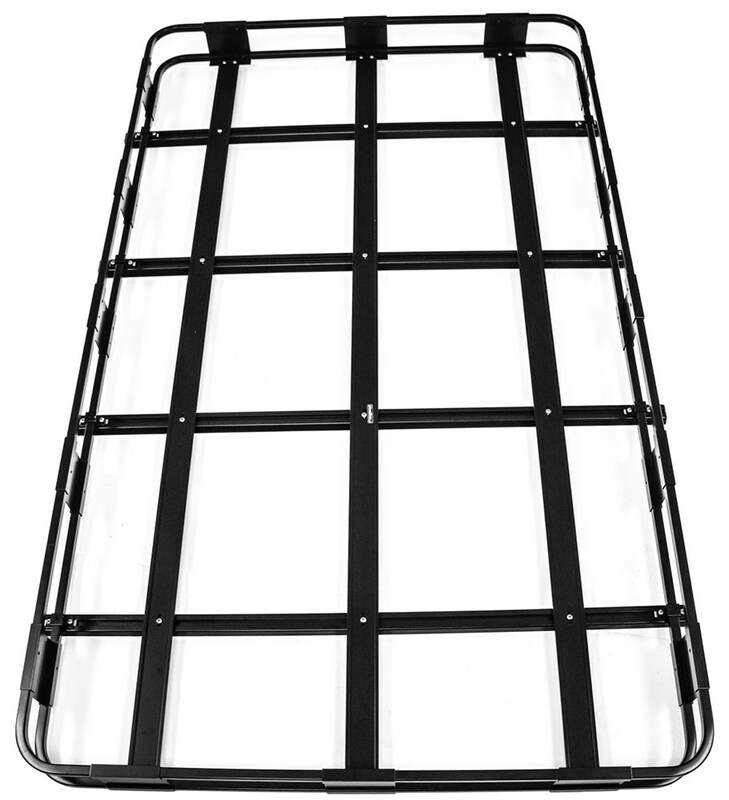 Lowest Prices for the best roof basket from Surco Products. Surco Safari Rack 5.0 Rooftop Cargo Basket for Thule Roof Racks - 84" Long x 50" Wide part number SPS5084-T400 can be ordered online at etrailer.com or call 800-298-8924 for expert service. Keep your vehicle's interior clean and uncluttered by transporting wet, dirty or oversize gear in this roof-mounted cargo basket. Durable, lightweight aluminum carrier fits Thule roof-rack square crossbars. S5084 and T400 Surco Safari Rack 5.0 for Thule Roof Rack - 84" x 50"
Keep your vehicle's interior clean and uncluttered by transporting wet, dirty or oversize gear in this roof-mounted cargo basket. 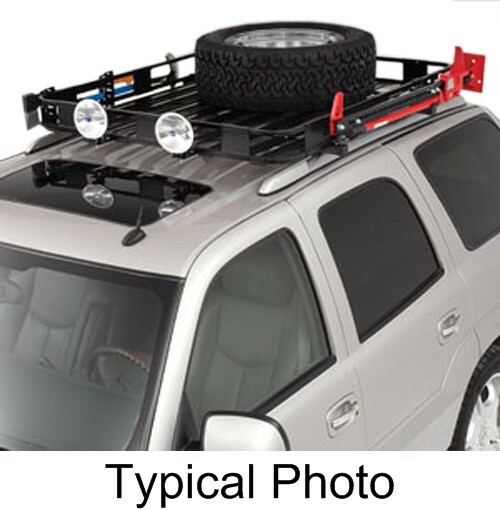 Durable, lightweight aluminum carrier fits elevated, factory roof-rack rails. 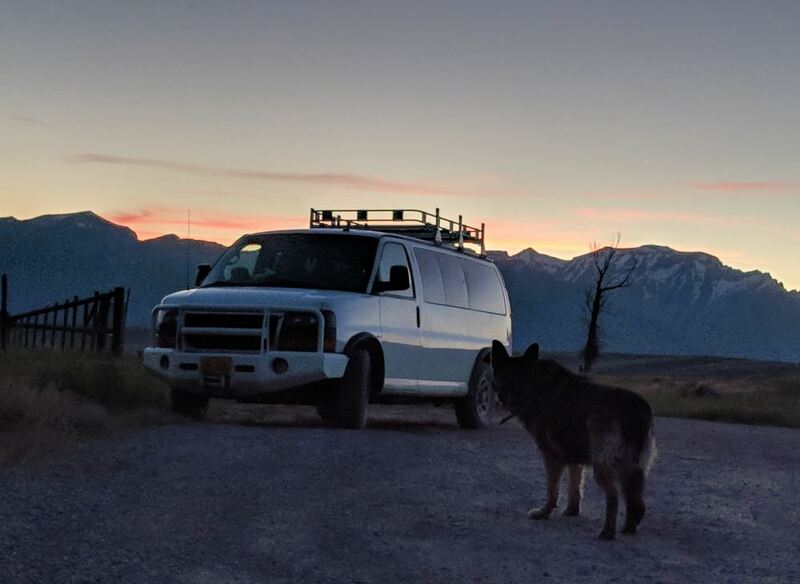 Rhino-Rack Roof Cargo Tray for Aero-Style Crossbars - Steel Mesh - 53" x 43"
Rhino-Rack Roof Cargo Tray for Aero-Style Crossbars - Steel Mesh - 49" x 37"
Today, we're going to be reviewing the Surco Safari Rack 5.0 Rooftop Cargo Baskets. These come in a variety of different sizes ranging anywhere from 45 inches wide to 65 inches wide and 50 inches long to 100 inches long. Today, the specific one we're going to be working with is part number SPS4560, it's a 60-inch by 45-inch basket. Now to see the variety of sizes, you can check out our website at etrailer.com. The Surco Safari 5.0 Rooftop Cargo Basket is going to be a great addition to have. It's going to allow you to free up room from inside your vehicle making more room for passengers or pets. It can also take care of hauling some of that nasty or dirty gear that you may have whether it's wet or muddy, it's going to keep it out of your vehicle and now it's on top of your roof. The Surco line of Rooftop Cargo Baskets are going to offer a weight capacity of 250 pounds. It's got a really nice floor design with the panels and the crossbars which is going to support whatever it is that you have to load in here. This is going to be made from a lightweight aluminum construction, but yet it's very strong and very durable. It's going to feature 3/4 inch square tubing, also making it very easy to get a tie down strap, bungee cord, or a ratchet strap with a hook around the outer wall. This basket features a durable black powder coat finish to help it stand up well against rust and corrosion. Now that we've gone over a few features, we're going to go ahead and show you how to install the Surco Safari Basket onto our roof rack. This rooftop basket is available in a variety of fits for your roof rack system, it's going to fit a square bar system which is what we are working with today. It will fit a round bar system and a factory roof rack system. Now, we've already got the basket positioned the way that we want on our roof rack system. The kit's going to include these baskets that fit over the side rail here on the basket. We simply need to line those up with our roof rack crossbars. It's going to come with these U-bolts that go around the underside of the bars and then we simply tighten those on by installing the included nuts. Now the hardware is going to be supplied with the kit. The baskets can be purchased with just the baskets and no kit, or they can be kitted together to include the fit kit. Once we have these loosely installed, we can go ahead and tighten them down. We are going to be using a socket wrench with a long socket on it today and the size is going to 7/16 of an inch. Now, I always like to make sure that it's tightened down evenly on both sides. All right, with this bracket tight, we'll repeat that same process for the other three. 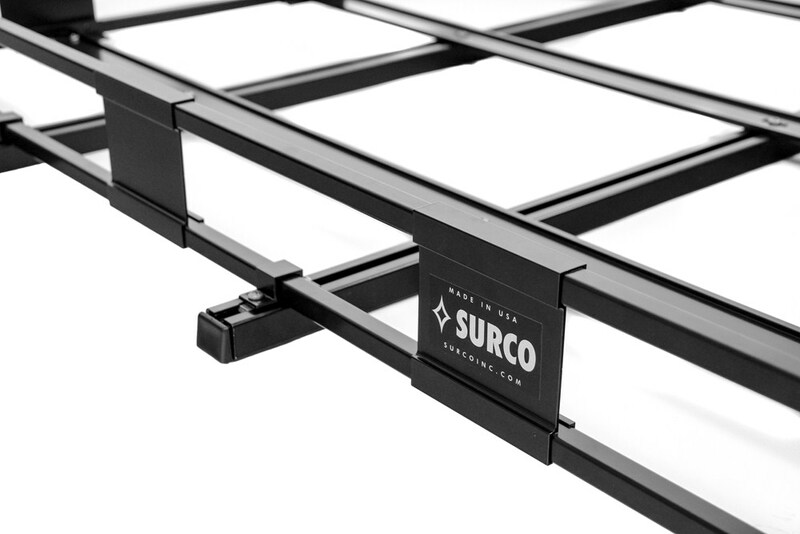 Surco offers some additional accessories that are going to be sold separately, but the accessories include a light mounting bracket, part number SPLT100; spare tire carrier, part number SPST100; a hi-lift jack carrier, part number SP1108; and an axe and shovel carrier, part number SPAX100. That's going to complete today's review of the Surco Safari Rack 5.0 Rooftop Cargo Baskets. Order: RelevanceNewestRating - High to LowRating - Low to High Keep your vehicle's interior clean and uncluttered by transporting wet, dirty or oversize gear in this roof-mounted cargo basket. 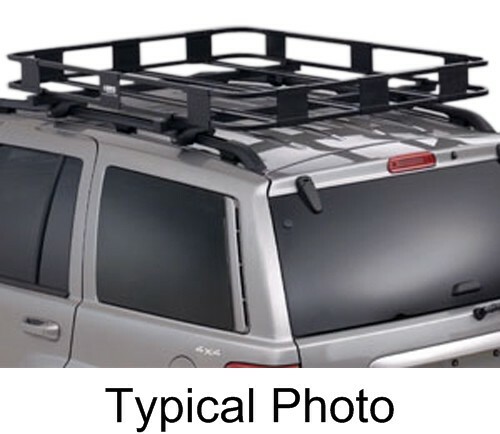 Durable, lightweight aluminum carrier fits Thule roof-rack square crossbars. I love it! I load it up a lot. It handles a lot of stuff. Unfortunately, any object installed on a vehicle roof is going to cause some wind turbulence, this is unavoidable. Surco doesnt offer a wind deflector at this time, Im sorry to say. 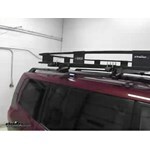 The roof rack I recommend that will work with your 2012 E-350 is the Thule roof rack using part # TH29055XT. I also recommend the Surco Cargo Basket, part # SPS5084-T400. This is our largest basket and it measures 84-inches long and 50-inches wide and is designed to fit the Thule crossbars. The Surco basket does not come with an extension. As long as the roof of your vehicle has the capacity for the 4-5 bales of hay you would be good. You will want to check the owners manual of your vehicle to determine the roof capacity and then figure out how much your hay bales weigh. 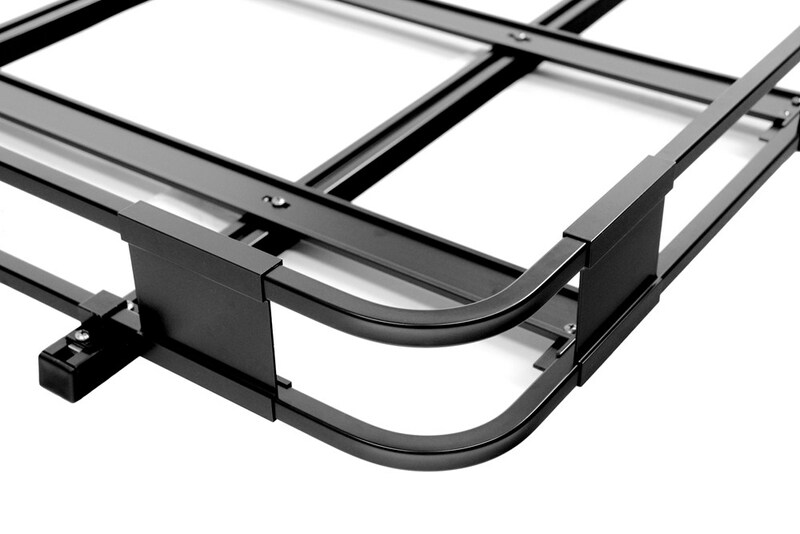 This rack is designed to be installed on a Thule roof rack. In my experience I've seen square bales weight from 35-70 lbs. For some ratchet straps to secure the hay you might also be interested in the Erickson Ratchet Straps part # 58503. First you will want to start with a roof rack on your 1995 Land Rover Range Rover Classic. For that you will want the Yakima roof rack that consists of the Round 66" CrossBars # Y00410 and the Yakima 1A Raingutter Towers # Y00101. 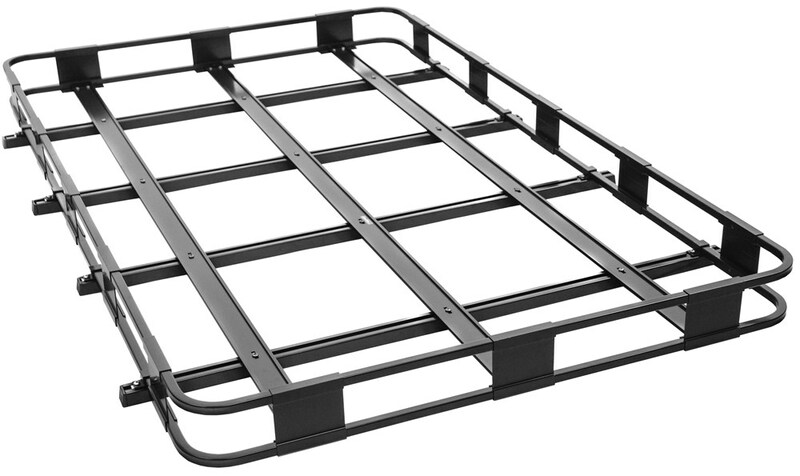 The absolute biggest roof rack cargo basket that would fit this roof rack would be the Surco Safari Rack 5.0 Rooftop Cargo Basket # SPS5084-Y400. To install the Surco Safari Rack 5.0 Rooftop Cargo Basket # SPS5084-T400 on your 2013 Chevy Suburban (or any vehicle for that matter), you will need to first have a Thule square bar roof rack installed on the vehicle. 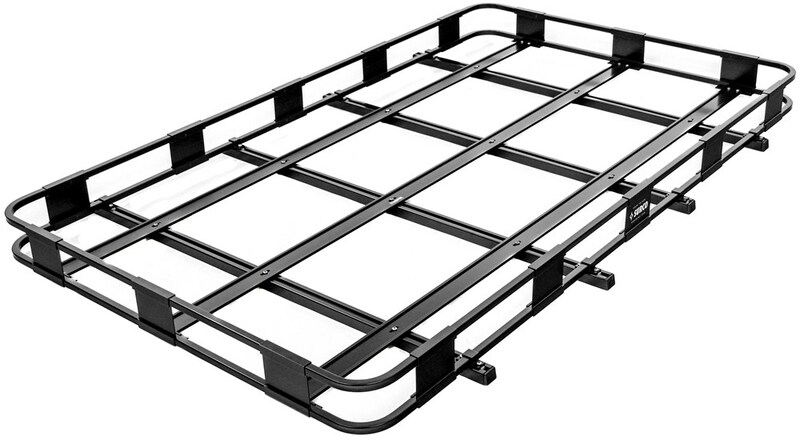 So for that you would need the part # TH45058 to install this rack on your Suburban. Or if you wanted a version of this cargo basket that could attach directly to the side rails of your vehicle you would want the # SPS5084-1101.